Bring a large pot of water to boil. Score and stem the tomatoes. Add the tomatoes and blanch for 20 seconds or until skins loosen. Remove tomatoes and quickly shock them in ice water, then drain. Peel the tomatoes, then slice in half. Squeeze out the seeds and strain through a fine mesh strainer and reserve the juice. Put all the peppers and the onion together in a pot and cover them with cold water. Bring to a boil, then strain the vegetables and shock them in ice water, then drain. 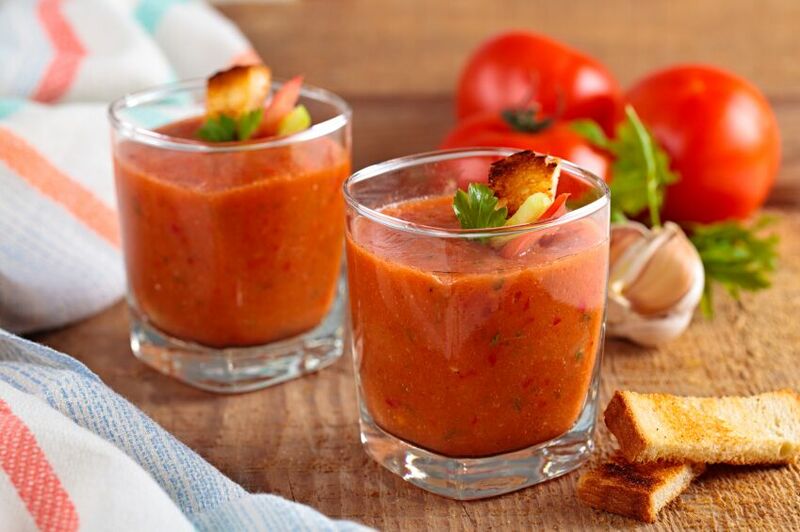 In a large bowl or container, combine the tomatoes, peppers and onion, cucumber, bouquet garni, sachet of spices, reserved tomato juice, and the kosher salt. Mix well and let marinate overnight. The next day, remove the sachet and bouquet garni and purée in a high speed blender until silky smooth. Adjust the seasoning with sherry vinegar, olive oil, salt and pepper, and a few drops of Tabasco sauce. Pour into shooter glasses and serve chilled garnished with freshly chopped basil. Serves 24.